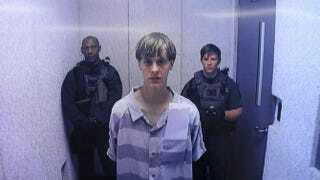 In this image from the video uplink from the detention center to the courtroom, Dylann Roof appears at Centralized Bond Hearing Court June 19, 2015, in North Charleston, S.C.
Far from expressing remorse, convicted murderer Dylann Roof is instead complaining that it is "not fair" that prosecutors present such thorough testimony about the impact of his massacre at a historically black Charleston, S.C., church on the loved ones of the victims, the Washington Post reports. “If I don’t present any mitigation evidence, the victim-impact evidence will take over the whole sentencing trial and guarantee that I get the death penalty,” Roof wrote in a court filing that was unsealed Thursday. Roof had declined to offer up any evidence or call on any witnesses in the penalty phase of his trial. The 22-year-old opted to deliver a brief opening statement, telling jurors that there was nothing wrong with him psychologically. “The point is that I’m not going to lie to you, not by myself or through somebody else,” Roof said Wednesday, speaking before the courtroom. It seems, now, however, that Roof is not partial to the fact that prosecutors are detailing emotional stories from the loved ones of the nine parishioners slain in Roof's attack at the Emanuel African Methodist Episcopal Church. According to the Post, U.S. District Judge Richard Gergel did not impose any limits on testimony, although he warned prosecutors about length beforehand. However, Assistant U.S. Attorney Jay Richardson argued that it is "important that the government and these individuals are allowed to tell stories of their loved ones." Roof has expressed no remorse over his actions, actually penning in a jailhouse journal after the shooting: "I am not sorry. I have not shed a tear for the innocent people I killed." Prosecutors originally said that they could call up to 38 witnesses to the stand, although Richard said Thursday that the final number of witnesses will probably be fewer. Although Roof did not present any evidence or witnesses on his behalf. Gergel told jurors that they could take into consideration his confession, his offer to plead guilty in exchange for life in prison, and the possibility that he could change as factors to rule in favor of a life sentence.